Sonoma Mountain Landscape, Inc. is located on an 11 acre ranch at the base of Sonoma Mountain where we are developing a nursery and demonstration garden for sustainable landscape practices. Through its natural beauty, Sonoma Mountain gives us inspiration for the work we do and our goal to bring about positive change through the services we provide. 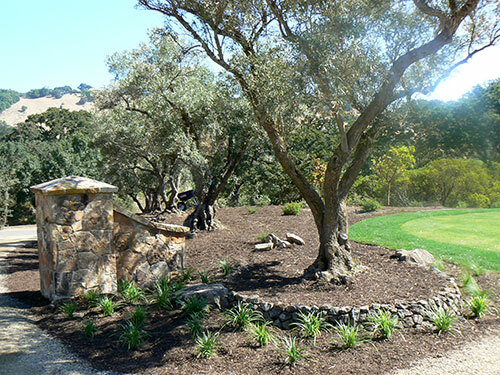 From design, to installation and maintenance, Sonoma Mountain Landscape strives to conserve water and energy; protect water and air quality; reduce waste to landfill; improve soil structure; enhance wildlife habitat; source materials locally and re-use materials onsite. These principles might be considered lofty and hard to achieve, but at Sonoma Mountain Landscape we take a common sense, metered approach. That means every initiative should be cost justified and achievable over a practical time frame. Simply put, our goal is to beautify your landscape in a way that reflects the natural beauty that surrounds us, do so in an environmentally responsible way, that reduces cost over the long term – that’s sustainable landscaping to us. ©2019 Sonoma Mountain Landscape Company, Inc.